Takemusu Aiki Bukiwaza refers to the practice of Aiki-ken and Aiki-jo techniques developed by O-Sensei and taught to Saito Sensei who categorised and catalogued these weapons forms as he incorporated them into his daily practice. Saito Sensei Shihan spoke often and in many different places about the incorporation of the weapon techniques he learnt from O’Sensei. He would say that O’Sensei did not practice in a “1-2-3 method”, rather he taught the young Saito Sensei, part or whole patterns of jo or ken movements. Saito Sensei explainsed that in order to remember the sequence of moves, he broke them down into individual elements and gave them names. So although the techniques originated with O’Sensei, it was Saito Sensei who named and catalogued the suburi movements and arranged the partner practices. The practice of Bukiwaza was central to the Takemusu Aiki practice handed down from O’Sensei to Saito Sensei which he continued to teach in the Iwama Dojo after the Founders passing in 1969 and for a period in the Aikikai Hombu Dojo in Tokyo from 1961 with O’Sensei’s approval. Saito Sensei was the only teacher, besides the Founder himself, permitted to teach Aiki bukiwaza there. “Generally speaking, Aikido is known by its taijutsu [body] techniques. However, the taijutsu movements are based on movements of the ken [sword].It is difficult to separate those movements which are based on the ken from those of taijutsu. Rather it is a harmonious blending of both that creates a single Aikido. In other words, both systems agree with each other. If one were to mix present forms of Kendo and Judo, and expect the result to be similar to Aikido one would be making a mistake. Even when using the same ken, Kendo and Aikido are very different even though they may appear to be similar.It would also be very difficult to explain Kendo in terms of Judo and vice versa. I would like to make an effort to preserve O-Sensei’s weapon system within Aikikai structure … As I am [the] only one of his [Saito Sensei’s] Japanese shihan who is teaching overseas, I believe that this beautiful art of O-Sensei, Aikiken & Aikijo training syllabus, should be returned to [the] Aikikai. Should Aikikai Australia be interested in O-Sensei’s weapon system, Aikiken & Aikijo, I am happy to return this unique training syllabus back to Aikikai Australia. I think it is important to keep O-Sensei’s weapon system as well as Sugano Sensei’s weapon system within Aikikai Australia, which is the only official organisation of Aikikai Honbu in Australia, when you consider the next 50 years of Aikido development in Australia. 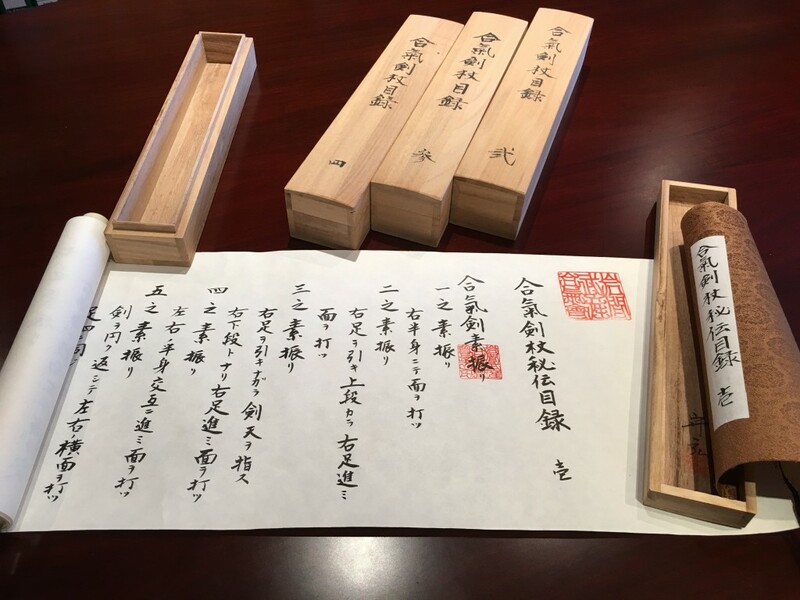 It was with this thought in mind that in August 2015, Takayasu Sensei conducted a weekend seminar to present the weapons training syllabus as taught by O-Sensei in the Iwama Dojo after World War II. 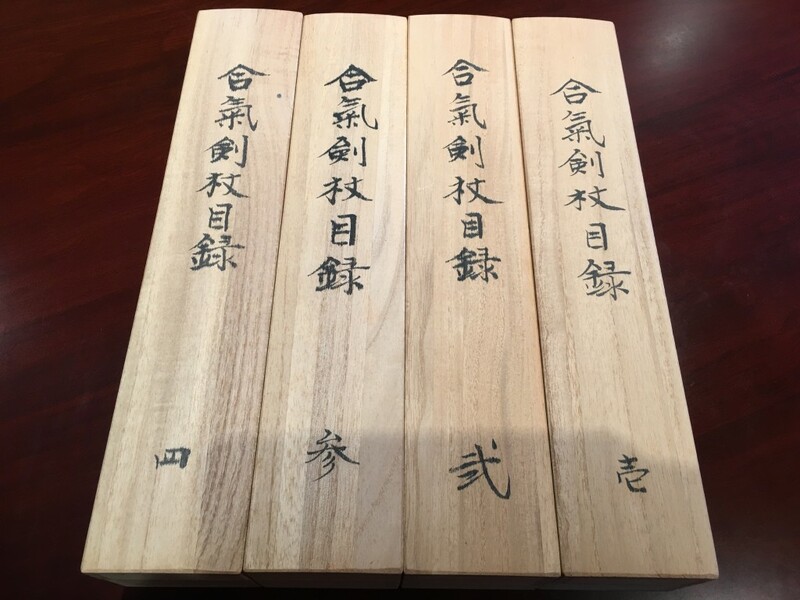 In March 1990, I was awarded the 1st, 2nd, 3rd and 4th Mokuroku (Aiki-Ken and Aiki-Jo) weapons scrolls personally by Saito Sensei Shihan after testing for them at the Iwama Dojo. To support that effort by my teacher to promulgate O’Sensei’s wiki-ken and aiki-jo forms, I have decided to teach and publish information about the Saito Sensei Mokuroku (weapons scrolls).